Hey everyone! I want to apologise for not being the best blogger at the moment, I have a lot of products building up and I'm definitely feeling the pressure but life has to come first. I've needed to prioritise my life off the internet for the past few weeks, and I still need to, but my blog has always been my escape and I want it to remain that way, so here I am escaping for a little while. I've been finding it hard to find the time to do my nails, let alone blog about them, but I managed to spend the entirety of Saturday doing nails and it feels nice to be able to have some new content to show you. Today's nails are kind of a fail, but as I've said before I want to document all my designs, fails or not. I've never tried watercolour nails before, mainly because I didn't think I had the necessary products (what is 'rubbing alcohol' when it's at home?). But then my lovely friend Very Emily informed me that all I need are some Sharpies and some nail cleanser, and I decided to buy a nice huge pack of Sharpies to give it a go (I'll always be a stationary hoarder at heart, so any excuse really). These were so simple to create, I was kind of just playing around and they turned into a design. It was so satisfying to see them turn into little bubbles rather than blobs of colour. 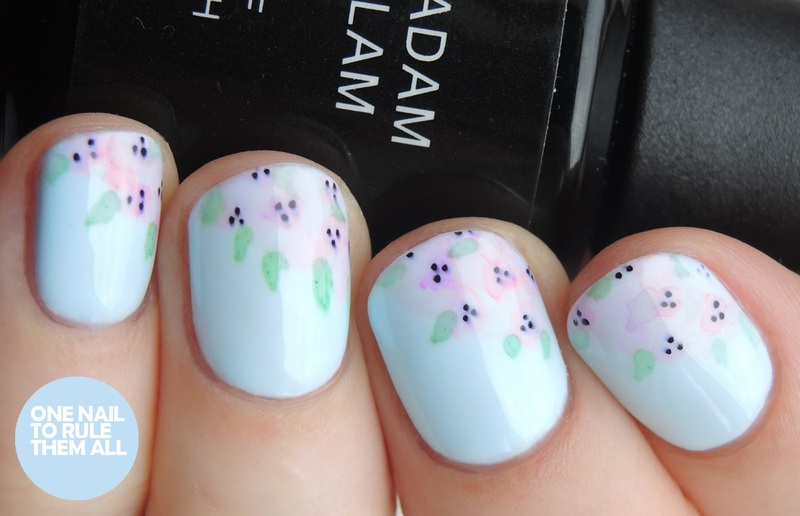 And I really loved the design ... until my topcoat smeared it everywhere. I don't know if it's because I used a gel topcoat, or if I should have used nail polish for the centre of the flowers rather than black sharpie? If you've done watercolour nails before let me know where I went wrong. I used Madam Glam - Pure Cloud*, then this set of Sharpie fine markers, plus Madam Glam Top Coat*. I'll have a full review of Madam Glam up soon but this was the first of their gels that I tried and I was really impressed, 3 thin coats and such a gorgeous colour. I cured it under my new MelodySusie Pro48W lamp, which I'll be doing a full post on soon but I really enjoyed using it. I totally get the feeling of having little time for your blog. Over the years I've been so inconsistent, buts it's always remained an escape and that's why I kept coming back to it. I hope you manage to find some balance to your life soon. As far as thinking this design is a fail, it's gorgeous. I love how delicate the flowers look, your floral designs are always so lovely.